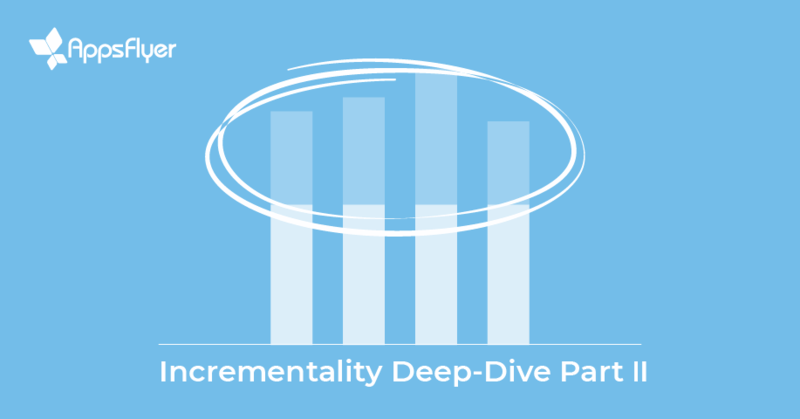 In part I of our Incrementality Deep-Dive blog series, we explored the concept of what it means for a campaign to deliver incremental value, and analyzed the impact a retargeting campaign had on acquired users. We did this by looking at the time between an app install and the exposure to retargeting, and found that, in most cases, retargeting proved its incremental value (full post here). This time around, we focused on the behavior of dormant (inactive) users of a global shopping app. Specifically, our scope explored the time between a user’s last engagement with the app and exposure to a retargeting campaign. Our first step was to isolate existing users who did not engage with the app during various time frames (between 14 and 90 days of inactivity). We then divided this group into two sub-groups: those who were exposed to a retargeting campaign and a control group of users who were not. The difference represented the incremental lift (positive or negative) of the retargeting campaign, only measured when a user performed an in-app event beyond the initial retargeting-driven app open. As far as reactivating dormant users was concerned, the retargeting campaign delivered clear incremental value, which only grew over time. In fact, among users who were active more than 90 days before being exposed to the retargeting campaign, but not in the last 90 days prior to the campaign, the re-engagement activity reactivated no less than 13% of users compared to only 2.6% of non-exposed users — a 5x difference! Clearly, retargeting dormant users was most beneficial later rather than sooner in relation to the previous engagement. This is probably because recently active users resemble organic users who are more likely to engage with an app without help from a marketing activity. This also explains why the percentage of re-activated users in both groups declines the longer the dormant period. If you are seeing similar results, it may be worthwhile to re-engage users through owned channels like email or push not long after they’ve turned dormant, and running paid retargeting more strategically after a longer period of inactivity. We can see that, when exploring revenue, incremental value was only demonstrated from 60 days since the last activity and onward, while shorter term re-activations actually delivered a negative impact. This was likely the result of misalignment between the campaign and the audience of short-term, inactive users, perhaps because the content/creative itself failed to engage this audience. There may also have been a gap between the content/creative and the immediate in-app experience that did not effectively engage this group. It is therefore important to take into account that the duration of inactivity could very well be a significant audience differentiator. That means each group should be dealt with as a separate segment that has different needs, demands, content, CTAs, in-app experience upon reactivation, etc. Retargeting also proved incremental for increasing the number of loyal users (defined as active users who were retargeted) and reducing churn. We found that the percentage of users who remained loyal was 20% higher among those exposed to a retargeting campaign. Make sure that, when re-targeting active users, your campaigns offer real value else you risk annoying this key user base that is already engaged with your app (which we all know is no small feat). As we’ve seen above, retargeting is not always incremental. A campaign can be successful for goal X, and unsuccessful for goal Y. It all depends on which goal is more important. In this case, we can see that the revenue goal was not achieved — the average revenue of loyal users who were exposed to the retargeting campaign dropped. Loyal users were less engaged over time and therefore generated less revenue — hence the negative baseline. In this case, the retargeting campaign failed to mitigate this drop, and had a negative effect on revenue. As mentioned, negative lift can occur when a retargeting campaign either annoys the user (often caused by increased frequency); when the content itself is not useful and misses its purpose; and/or the audience targeted is not aligned with a campaign or the in-app experience the user encounters as soon as the app is opened. It is another reminder to make sure all elements of the user experience — from frequency, to creative and messaging, through in-app experience — are seamless and interconnected. After we’ve explored the prospects of retargeting incrementality, and have demonstrated that it is important a) to measure it, and b) to understand in which scenarios it delivers positive lift and which not, the next step would be to actually do it. In the next chapter of this series, we’ll review how to measure incrementality. Stay tuned.